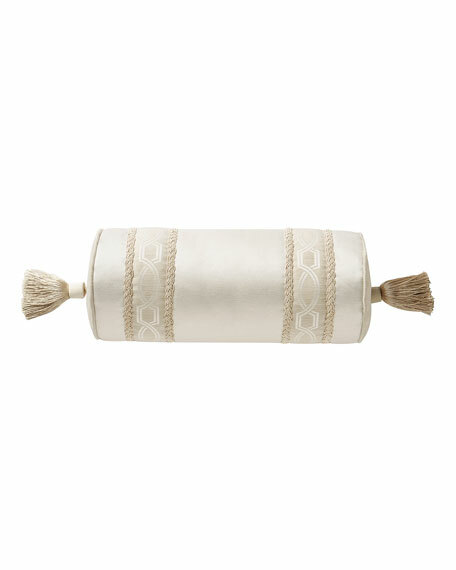 Waterford Lancaster Neck Roll Pillow, 7" x 16"
WaterfordLancaster Neck Roll Pillow, 7" x 16"
A banded neck roll with intricate braided rope details is finished with luxurious tassels. Neck roll pillow with tassel ends. EXCLUSIVELY AT NEIMAN MARCUS Satin neck roll pillow with rhinestone accents. Silk button ends. Body, polyester/silk. Fill, polyester. 8"Dia. x 19"W. Dry clean. Made in the USA of imported materials.